The World Players of Handball is proud to be on site at the 65th USHA National Four-Wall Championships at the Los Caballeros Sports Village in Fountain Valley, CA. 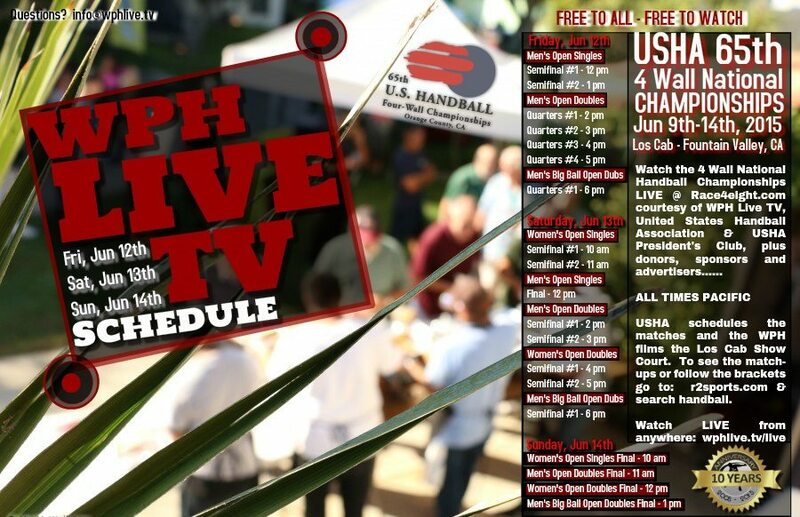 The World Players of Handball will be providing updates throughout the opening rounds and will be live streaming coverage starting Friday, June 12th through Sunday June 14th on race4eight.com. The Men’s Open Singles kicked off on Day One at Los Caballeros Sports Village, with current WPH R48 top 16 pros Abraham Montijo and Vic Perez advancing to the round of 16 with victories over Mike Semplice and Jesse Aranda, respectively. Anthony Sullivan, Dan Armijo, Jeff Streibig, Luis Bustos and Shorty Ruiz joined Montijo and Perez in Wednesday’s round of 16. Junior WPH “Naty Gonzalez” cd. Juarez junior handball players made the 12-hour drive from Juarez with head coach Richie “Drft” Fernandez and raced from court to court to play points between matches as they prepared for their opening round junior matches later in the week. The World Players of Handball kicked off the 65th USHA Four-Wall Nationals with a Pre-Nationals Victory Party in Huntington Beach to welcome several of the sport’s premiere stars to the USHA’s flagship event. Current women’s world champion Aisling Reilly, former WPH R48 #1 Charly Shanks, current WPH Outdoor Elite 8 star Sal Duenas and many more joined the WPH in kicking off one of the best weeks of the year in handball.